I greatly appreciate your further guidance and encouragement. The Yu-cho Foundation is an organization which aims to promote public welfare by conducting research studies and providing research grants in the area of personal savings including the improvement and promotion of postal services for post office customers. Besides, the foundation has supported international volunteer activities, financial education and consultation. The Yu-cho Foundation has been conducting research studies since 1969 as the Postal Savings Promotion Society. At the same time, the society was engaged in managing Mielparque Hotel’s accommodation and banquet service. 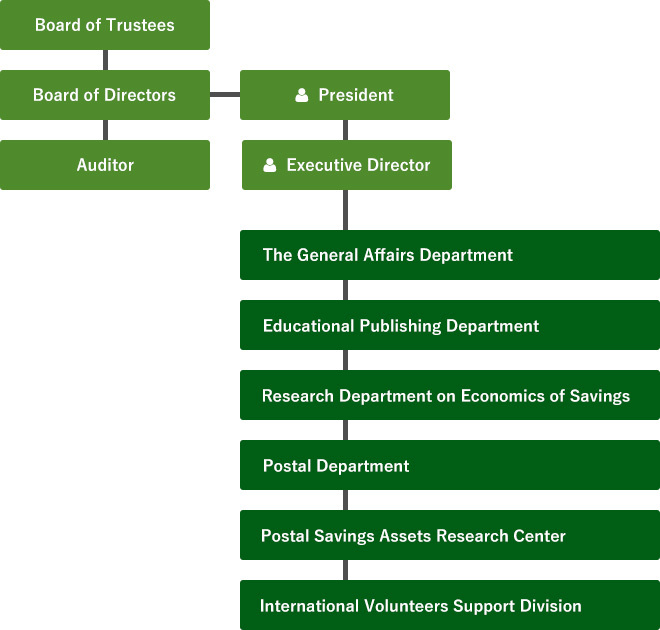 The organization, which was renamed in 2007 to the Yu-cho Foundation, has experienced the merger of both the Research Institute for Postal Savings Fund and the Postal Savings for International Voluntary Aid Promotion Association in 2006 as well as the Postal Service Center in 2008. In that year the Yu-cho Foundation ended the management of Mielparque and transferred its management to the Japan Post Holdings. The Yu-cho Foundation has applied to the Cabinet Office for the approval to change its legal status to a general incorporated foundation in order to correspond appropriately to the new institutional reform of Public Interest Corporation. In November 2011, the foundation started a new financial consultation business, and changed to a general incorporated foundation on April 1, 2012. Under the new “general incorporated foundation” status, the foundation hopes to continue providing various research throughout the postal service areas, conducting various businesses in order to enhance financial products and services which are essential to people’s lives from the consumer oriented perspective and contribute to the creation of a solid foundation of the people’s lives enrichment. Yu-cho Foundation(hereinafter referred to as the Foundation) is the organization which aims at promoting public welfare by conducting the study research and providing the research grants in the area of personal savings including the improvement and promotion of postal service toward the post office customers. The Foundation has applied to Cabinet Office for the approval to change the legal status to general incorporated foundation status in order to correspond appropriately to the new institutional reform of Public Interest Corporation and has changed to general incorporated foundation on April 1 ,2012. Main activities of the Foundation are seven projects listed below. Conduct fundamental and technical research on the personal finance including postal savings in order to promote public welfare and contribute to creation of people’s lives enrichment. Conduct research and analysis on the financial economy and financial markets domestically and globally. The results of the research are provided publicly to contribute to the stability of people’s lives and the promotion of public welfare. donations from Postal Savings for International Voluntary Aid(POSIVA). Subsidize a portion of expenses for the groups to hold a debrief session of their overseas activities and the similar seminars in order to contribute to promote grass-roots voluntary activities. Organize consultation meetings on financial topics by dispatching financial specialists to provide consultation for problems such as savings, investments, pension, multiple debts, inheritance tax, etc and to provide useful information on financial incurred damages. Grant a portion of the necessary expenses for NPOs to organize the consultation meetings on financial topics. Open several correspondence education programs for the purpose to enhance the acquisition of qualification and necessary skill for the people including the employees of Japan Post Group to deal with financial matters. Conduct training for newly-hired employees in entire Japan Post Group , offer seminars on management for administrators, and dispatch financial specialists and instructors to pension consultation meetings and pension seminars for the customers of Japan Post Group .